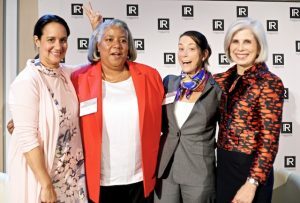 IR Magazine’s Women in IR campaign has sparked a lively debate around the globe about how women can achieve gender equality and pay parity in the IR profession. Our researched showed that while the IR profession has a 50/50 gender split, 67 percent of senior positions are held by men and just 33 percent by women. Such stats are depressingly familiar throughout the business world. Within IR, however, the news came as a surprise: IR has always been an industry with many women in senior positions. This evening is part of our global initiative of events, articles and research reports aimed at throwing diversity within the IR profession into the spotlight. We’d love to have you join the debate. We would like to invite you to take part in our new speed mentoring session at the Women in IR event in NY. We offer three 20-minute sessions with some of the industry’s most senior and experienced figures to help mentor and advise the talent of tomorrow. Get notes on how to deal with specific challenges, improve ways of working and structure your career. If you, or someone you know is interested in taking part, you can book your slot when you sign up for the event. Simply tick the box that you would like to join the session. Spaces are extremely limited and we want to ensure that they are all taken advantage of, so please book now to avoid disappointment. What their primary focus is for job satisfaction. It then compares these with those of their male counterparts to see where gender differences lie. The report goes beyond the headline figures to identify when and where men and women are treated differently – and, indeed, equally – in their pay and career experiences. It shows that, while there is little overt or deliberate sexism in IR, a number of circumstantial factors have led to the overall gender disparity we currently see. Find out more about the report. BNY Mellon is a global investments company dedicated to helping its clients manage and service their financial assets throughout the investment life cycle. Whether providing financial services for institutions, corporations or individual investors, BNY Mellon delivers informed investment management and investment services in 35 countries and more than 100 markets. As of March 31, 2015, BNY Mellon had $28.5 tn in assets under custody and/or administration, and $1.7 tn in assets under management. BNY Mellon can act as a single point of contact for clients looking to create, trade, hold, manage, service, distribute or restructure investments. BNY Mellon is the corporate brand of The Bank of New York Mellon Corporation (NYSE: BK). Additional information is available on www.bnymellon.com, or follow us on Twitter @BNYMellon. Cowen Inc. is a diversified financial services firm and, together with its consolidated subsidiaries, provides investment management, investment banking, research, sales and trading, prime brokerage, global clearing and commission management through its two business segments: Cowen Investment Management and its affiliates make up the Company’s investment management segment, while Cowen and Company, a member of FINRA and SIPC, and its affiliates make up the Company’s investment bank segment. Cowen Investment Management provides investment management solutions to a global client base and manages a significant portion of Cowen’s proprietary capital. Cowen and its affiliates offer industry focused investment banking for growth-oriented companies, domain knowledge-driven research, a sales and trading platform for institutional investors, global clearing and commission management services and also a comprehensive suite of prime brokerage services. Founded in 1918, the firm is currently celebrating its 100th Anniversary and is headquartered in New York with offices worldwide. To download Cowen’s investor relations app, which offers access to SEC filings, news releases, webcasts and presentations, please visit the App Store for iPhone and iPad or Google Play for Android mobile devices. ZRG Partners’ mission is to bring talented candidates to leading companies. We adhere to a set of core values that allows us to fulfill our clients’ needs on an optimal scale. We take pride and care to ensure that the core values we instill in our staff help our clients acquire strong leadership within their company. The event is open to all IR professionals – men and women – to build on last year’s discussion and learn how those leading the way are facing challenges head-on. Please note that these are our early bird rates which expire on Friday, July 12, 2019 – any bookings made after this date will be charged at the standard rate. IR Media Group (USA) Inc, the owner of IR Magazine, Corporate Secretary and IRspace, respect the privacy of every person who visits, registers with or subscribes to our websites and online publications, and is committed to ensuring a safe online experience. This privacy statement applies to all IR Media Group’s websites as listed under the heading ‘Sites’ and outlines the information IR Media Group may collect and how we may use that information. It also explains what we do with information about you when you register to attend one of our events.